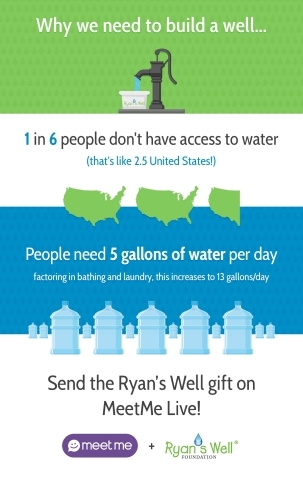 NEW HOPE, Pa.--(BUSINESS WIRE)-- The Meet Group, Inc. (NASDAQ:MEET), a public market leader in the mobile meeting space, is partnering with the Ryan’s Well Foundation to bring clean water to people in need, by releasing a limited edition Ryan’s Well virtual gift to users on the popular MeetMe and Skout applications. The Ryan’s Well Foundation is a charitable organization founded in 2001 and has provided access to clean water and sanitation to more than 924,000 vulnerable people in 16 developing countries worldwide. In honor of National Friendship Day on August 5th, The Meet Group’s popular livestreaming apps MeetMe and Skout will offer a custom gift that can be purchased to help raise money for this worldwide issue. The Meet Group will make a donation for every one of the Ryan’s Well gifts users send up to $10,000 to Ryan’s Well Foundation over the campaign. The Ryan’s Well gift will be available from July 26th through August 9th. Celebrity country singer, Lindsay Ell, will support the cause by hosting a livestream on the MeetMe app. To watch the broadcast, download the MeetMe app.